1 player behind the goal. - Open up the middle to strand the goalie. A Circle offense forces the adjacent slides and confuses a typical crease-sliding defense. When the adjacent slide goes this often leaves the adjacent offense player open for a back door cut, and the ball carrier can draw and dump to feed the cutter to score. 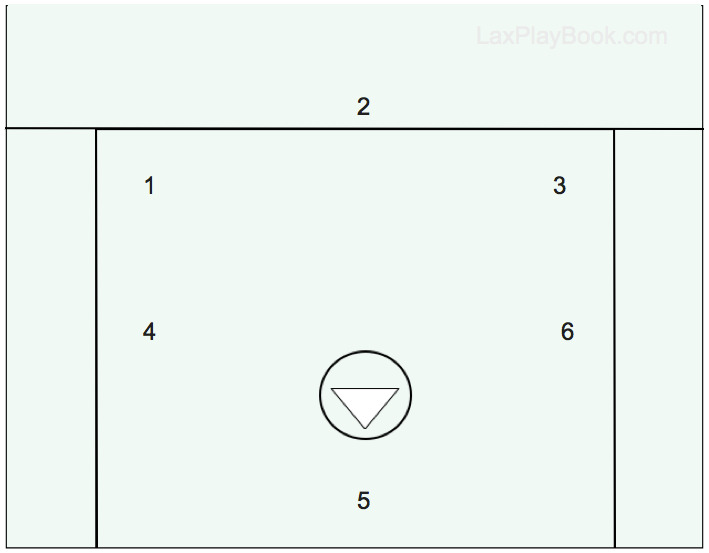 The Circle 1 Set gives the offense good spacing and opens up a huge area for cutters from the back-side of the offense, especially through the middle, and forcing the adjacent slides also opens up large areas for good outside shooters to take advantage of. The Circle 1 Offense is a complimentary alternative offense for beginners building out of the conventional 2-3-1. Against a zone defense circle offense does little, however a slight repositioning or drive from X allows the 2 man game can be used to attack and overload a corner zone. Since the crease zone defenseman would stay in position to make a slide the finish would still need to come from an additional offense teammate. In a Circle 1 there is only one player in optimum position to back up shots at X, and if he presses toward the goal as part of a play he might be unable to win the sprint to the line to retain possession on a missed shot.